When Matt Booth left Davidoff early last year, he took his Room101 brand name with him. And while he collaborated with two other cigar companies to release Hit & Run and The T, neither cigar project was part of his official Room101 portfolio. Now, Booth is gearing up for the national launch of Room101 Farce, the first Room101 branded cigar since his departure from Davidoff in 2017. 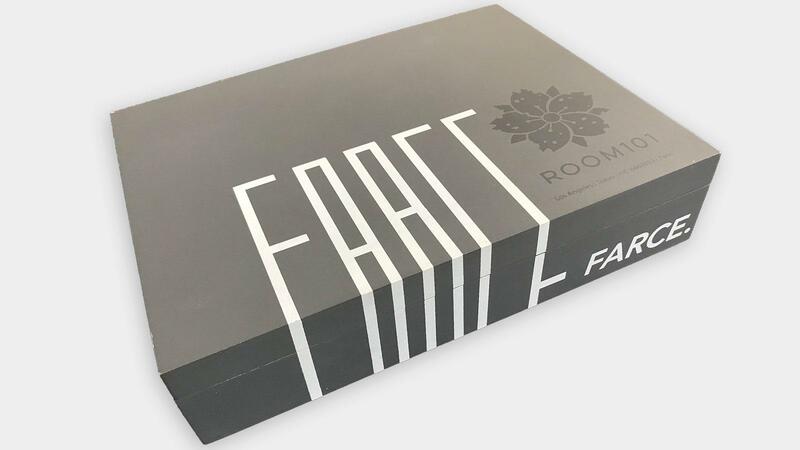 Farce had a soft launch last month in Arizona at Fox Cigar Bar and is expected to launch nationwide later this spring. “Shipping [will begin] roughly end of April beginning of May,” Booth told Cigar Aficionado. Room101 Farce is rolled with an Ecuadoran wrapper, Indonesian binder and filler tobacco from Pennsylvania, the Dominican Republic, Nicaragua, as well as leaf from an undisclosed origin. The cigar will ship in four sizes, each named after the measurements of the cigar: 42x6.5 ($10.50); 52x5 ($10.90); 54x6.25 ($11.90); and 60x6.5 ($12.90). There is also a 42x4.5 size that’s positioned as an event-only exclusive. All sizes of Room101 Farce (except the event-only size) ship in 20-count boxes. Farce is rolled at Tabacalera William Ventura in the Dominican Republic, the same cigar factory that makes Hit & Run, a cigar brand Booth made in conjunction with Caldwell Cigar Co. Booth also worked with Caldwell and cigarmaker A.J. Fernandez to create The T, an Ecuadoran Habano-wrapped cigar rolled at Fernandez’s factory in Nicaragua. Booth says that he plans to continue working with Fernandez. “Future releases within this series are slated to be manufactured with AJ Fernandez in Nicaragua and all are to be distributed by Down and Back, LLC,” Booth said. Down and Back, LLC is a distribution company founded by Robert Caldwell of Caldwell Cigar Co.